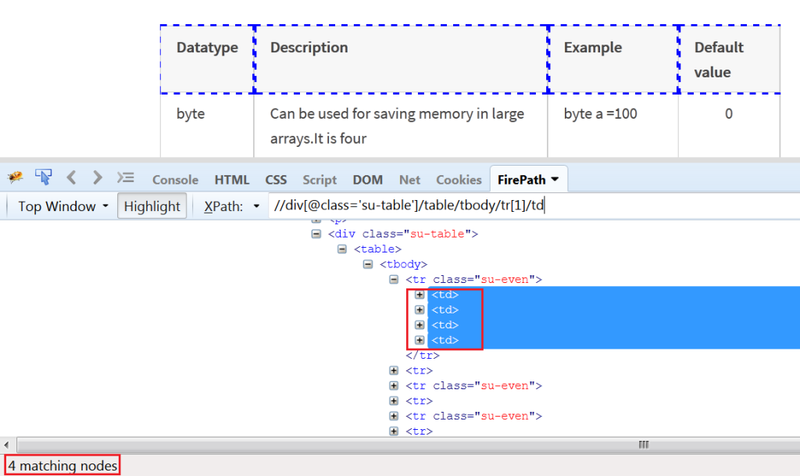 WebTable is a very common feature you will find almost in every application. It contains a combination of rows and columns. Sometimes, there are requirements like you need to read the data from the webtables and use it as an output for some other functions , verify that data is correctly populated or not in the webtables etc. We will take the example of a Webtable present in the the ‘www.testingpool.com‘. You can access this webtable at “http://testingpool.com/data-types-in-java/“. This webtable displays the information about different data types in java. In WebTable , we can perform operations like counting total no. of rows, counting total no. of columns, extracting data etc. Let’s understand this with examples. 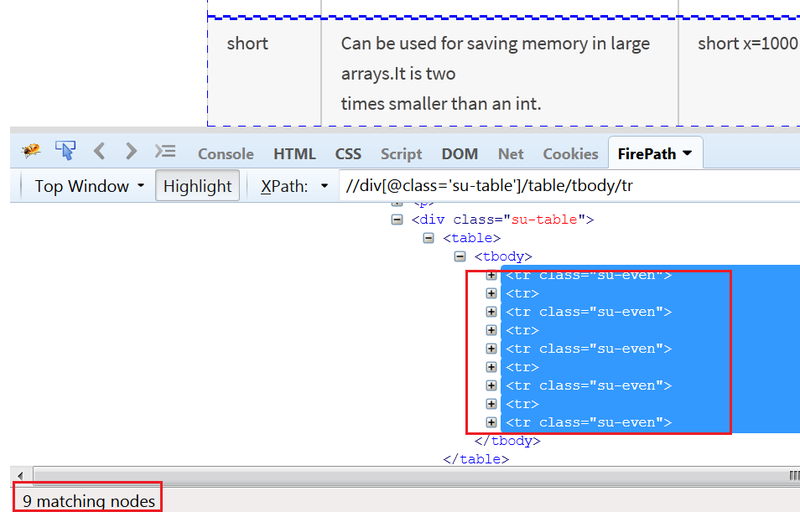 1 tr tag(rows) can have multiple td tags(columns). How to count no. of rows in a WebTable? We will create a Xpath to count the no. of tr tags in a table. As you can see in the below figure, this xpath returns total 9 rows. How to count no. of columns in a WebTable? We will create a Xpath to count the no. of td tags in a tr tag. As you can see in the below figure, this xpath returns total 4 colums. For extracting the data from WebTable, we will count no. of rows and columns. Then, we create nested for loop by using no. of rows and columns and use the method ‘getText()’ to extract the data. 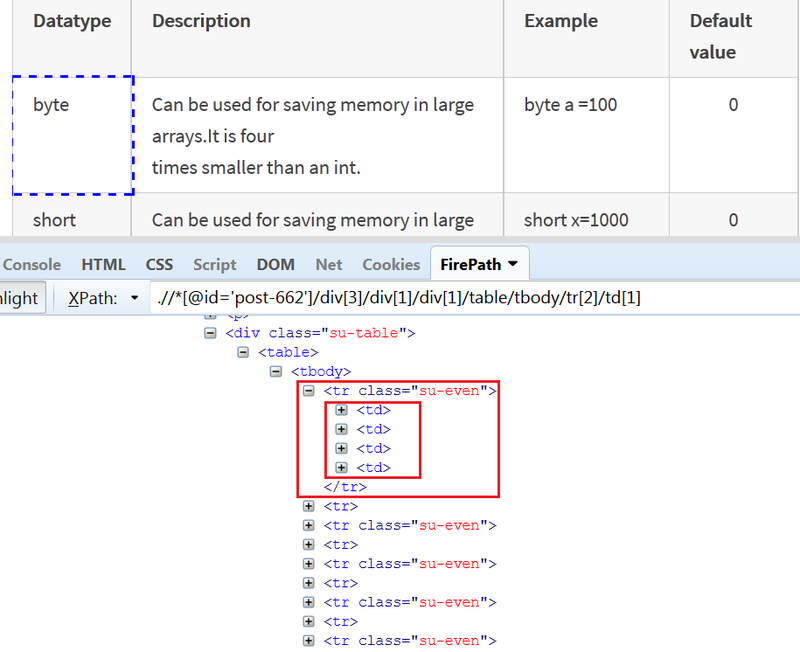 byte Can be used for saving memory in large arrays.It is four times smaller than an int. 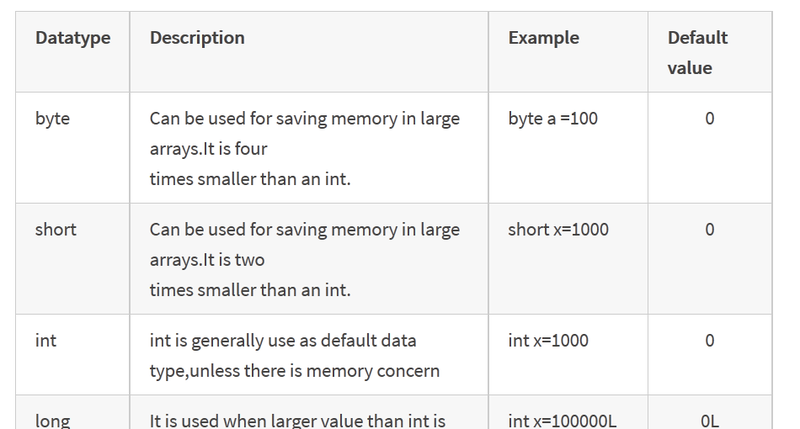 byte a =100 0 short Can be used for saving memory in large arrays.It is two times smaller than an int. short x=1000 0 int int is generally use as default data type,unless there is memory concern int x=1000 0 long It is used when larger value than int is needed. int x=100000L 0L float use it if needs to save memory in large arrays of floating point numbers. int x=176.8f 0.0f double It is generally used as default value for decimal values. int d=176.8 0.0d boolean Its 2 possible value are – true and false. boolean name=true false char Char data type is used to store any character. char c =”A” ‘\u0000? I have a question. How to store same table in HashMap? 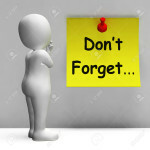 Raghu, Please find the code below where you can store first column as key and remaining columns as values in Hashmap. Hope, it helps.